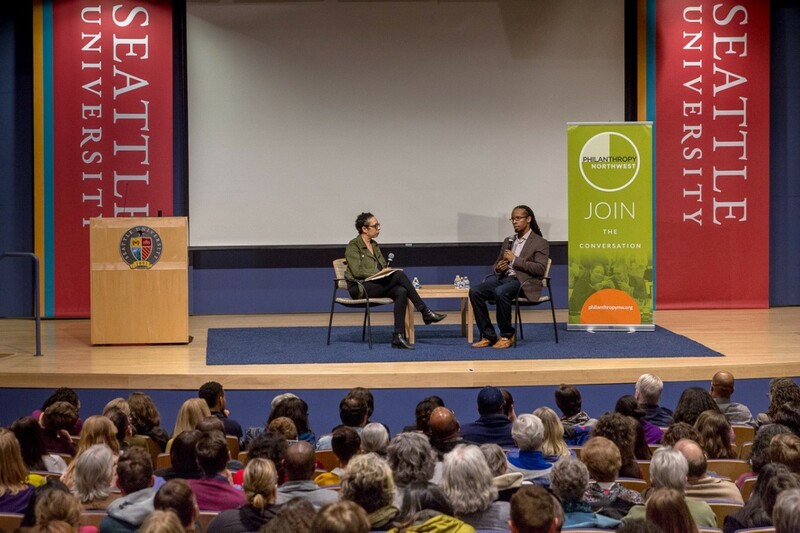 More than 400 people gathered on Friday, March 9 in Seattle University’s Pigott Auditorium to attend our inaugural Equity Speaker Series featuring a community conversation with Dr. Ibram X. Kendi, National Book Award winning author of Stamped From the Beginning: The Definitive History of Racist Ideas in America. The event was co-sponsored by Raikes Foundation, Seattle Foundation, Casey Family Programs, Seattle University and Elliott Bay Book Company. Racism is the idea that a racial group is inferior in any way to any other racial group. Racist ideas blind us to racial discrimination, and a racist is someone who expresses a racist idea or supports a racist policy through their action or inaction. To understand racism, we must grasp the marriage between racist ideas and racist policies. Being racist – like being an antiracist – is not a fixed category. Being racist is not who you are but what you do/don’t do and what you say/don’t say in the moment, and in response to racist policies. Why do people and groups produce racist ideas? Are they ignorant or hateful people? Not usually. People produce racist ideas and policies to protect and maintain their wealth and power. The problem is not people, it is policy—and there is no such thing as a race-neutral policy. Policy either increases, maintains or reduces inequality. A racist policy is any policy that yields a racially unequal outcome, regardless of intention. Antiracist policies are those which reduce racially unequal outcomes. There’s no philosophy or category of ‘not racist’ – instead, the construct is racist or antiracist. When you begin to understand the problem is not people but policies, you can become antiracist. Antiracism will free us from being manipulated by racist ideas. Whether with your time or with your fiscal resources, challenge racist policies. When you hear ideas in your sphere that are racist—say so. We need to bolster our children’s armor with antiracist ideas to prepare them for the world they live. Thank you for your inspiring leadership, Dr. Kendi – we are so grateful for your insights and teachings!